Briella's Journey: We have a 5 Pounder !!! 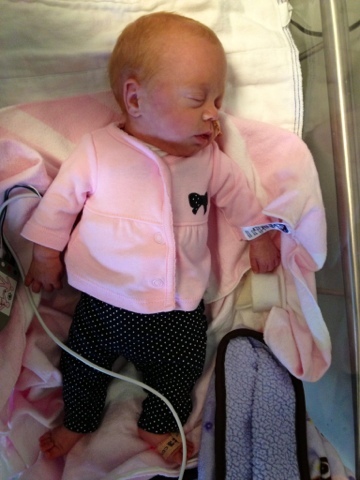 I cannot believe that my teeny micropreemie has gained another pound in 9 DAYS!!!! She is now my big 5 pound 2 ounce baby!!!!!!!! I am astonished at her progress. I am going to take home a 6lb baby I bet!! 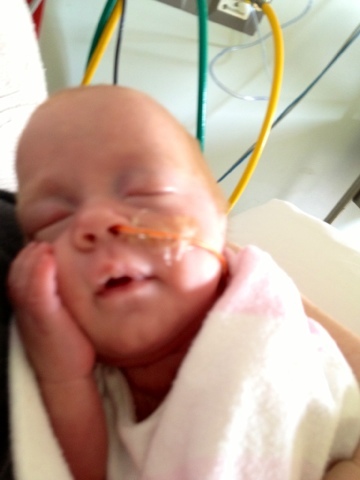 Briella is fed around the clock, every 3 hrs whether she is awake or not. They just hook her feeding tube up to a pump that pumps the milk at a consistent pace over 45 minutes. She is still allowed to try a bottle twice a day. Today's bottle was scary for Mom. As soon as Briella started to eat, her heart rate dropped to the 50s (a Brady.) I was stimulating her & couldn't get her to come back up. A nurse had to come in to help us. She also has been doing her periodic breathing. That's where she will go breath, breath, breath paaauuuussseee breathbreathbreath. It is very intense to watch. I will never become immune to it as I have other alarms. Yesterday we were unable to come visit the little princess. Big sister has strep throat again. All 3 of us are on a round of antibiotics so we won't get Miss Brie sick. So we stayed away for a day. Today, when I was one stoplight away from the hospital I started getting all excited and jittery. I felt like I was getting off a plane to see someone I hadn't seen in a long time. The elevator was taking so long. The scrub in process took forever. The almost run to her room was too long. I went over to her crib and told her mommy is here, like I always do when I first arrive for the day. Of course I start crying because I'm sure she just looks so much bigger than the last time I saw her. She opened her eyes and fussed until I was able to pick her up. It made me feel like she actually missed me. I am a little uneasy about the snow we are supposed to get tonight. Aubrey has already said she's scared of the "snow storm" and wants to sleep with us. So I know I need to be home. But I don't want to be snowed in and not make it to the hospital tomorrow. I also want to be here for Briella's first snow!! I will be happy when both my babies are in the same place! While I am REALLY excited about Briella being 5lbs, I am worried that she isn't getting taller. She is still 15 & 3/4ths inches long. Aubrey at birth was 6lbs 10oz & 19.5" long. Briella's head is growing normal though. I remember a girl I went to school with who was very short and petite. I believe she had hearing aids. I remember someone telling me she was so little because she was born very early. I just want to go back in time and hug her. I wish we would've been friends. Please pray that Briella's breathing becomes consistent and normal. Pray that she stays infection free & continues to grow healthy. Below there is a picture of her French Poodle that is good for her eyes to focus on. 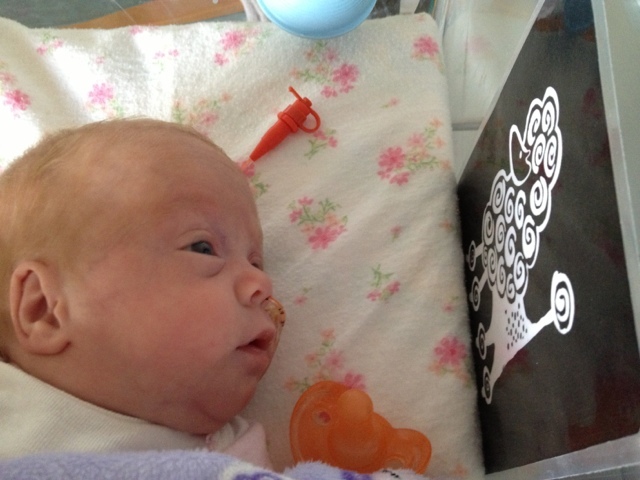 She loves spending time staring at all the swirls, dots and color contrasts. So glad she's gaining weight! It doesn't seem that. Long ago you were posting she was two pounds!